There are some things I really like about Starbucks and some things I really hate about them. I love the taste of their frappuccinos, although I'd probably take a Coffee Bean & Tea Leaf frozen drink over a Starbucks. I like the vibe in most Starbucks locations, and I like that they provide inexpensive health care to their workers. But I hate how they crush mom & pops coffee shops, and I hate that they practically have a monopoly on the pre-packaged frappuccino market. From time to time, I'll see Seattle's Best or some other cold coffee drink pop up in supermarkets, but many times, they wind up disappearing soon thereafter. I guess they simply can't compete with Starbucks' sales. And I very rarely see another brand name cold coffee beverage in convenience stores. So every chance I get, I try to buy the competition's cold coffee drink. This Archer Farms product is a good example of why that's not always a good idea. In its defense, it is low-fat. But it tastes like it, too. It almost tastes watered-down to me. 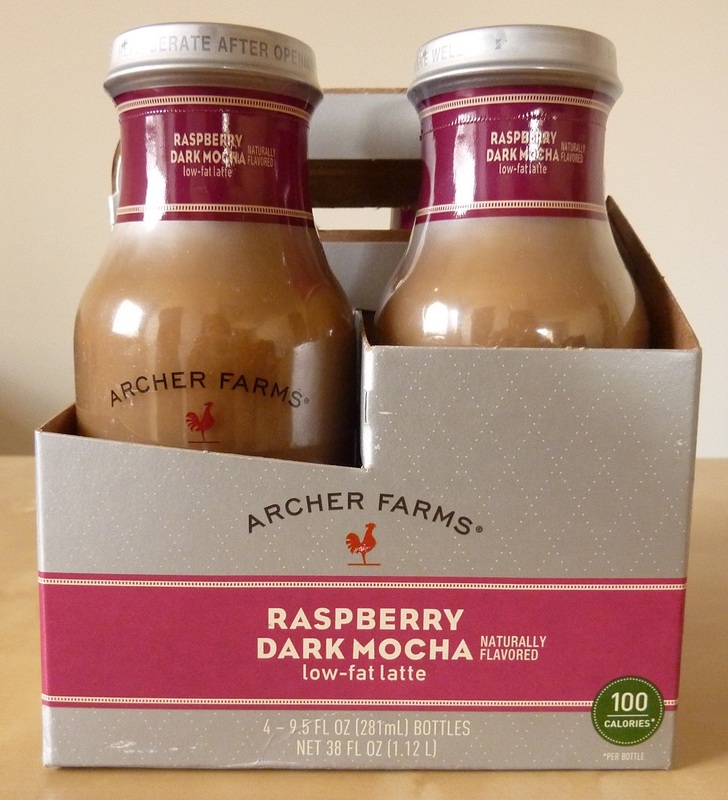 The level of raspberry-ness is pretty good, but there's very little mocha flavor. It honestly tastes like they made a half-decent frappuccino-style drink and then cut it by adding water. Like, lots of water. At 100 calories, I can't complain too much. 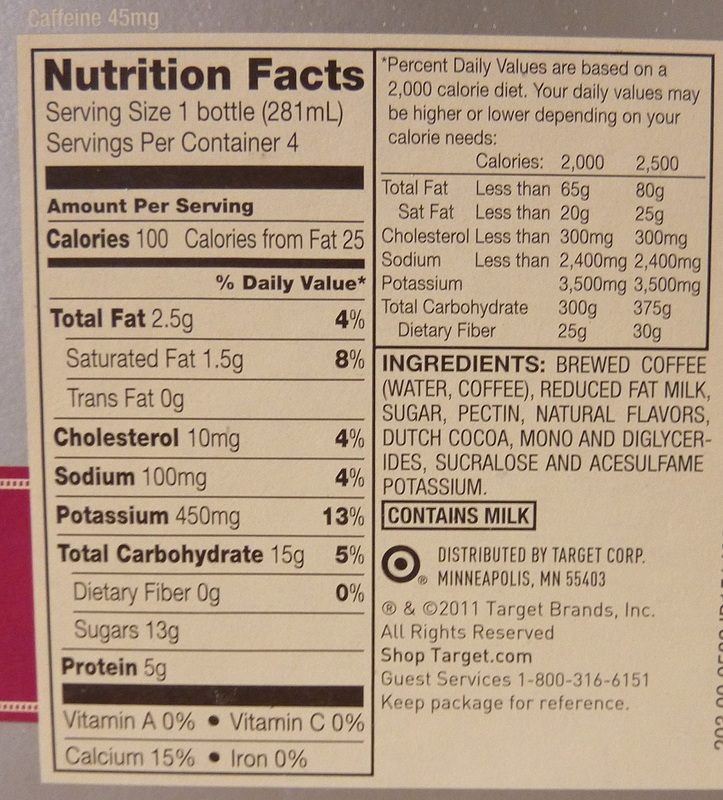 And after all, the main reason people drink coffee isn't just for the taste, but for the effect of the caffeine. 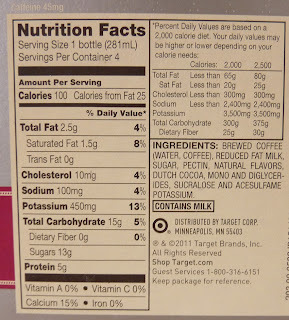 And this product contains caffeine. I'm not sure how much, but it definitely has some. And don't get me wrong, it doesn't taste bad, it just isn't particularly dessert-ish. 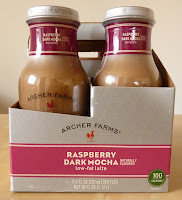 Certainly not as dessert-ish as I wanted it to taste, and not nearly as dessert-ish as "Raspberry Dark Mocha" sounds. I can totally conceive that there are people out there that do like this product, but I'll certainly never buy it again. I'm torn between 5 and 6 stars. I assumed my wife would like these more than I did, but she actually found them revolting. So I'll go with 5. I give this product 5 out of 10 stars. Thank you for this post as it will give us a guide line to buy things. This raspberry dark mocha latte looks yummy but you have rated it average. It is a good idea to have such review before you give it a try. Thanks once again.